Hola! It's the last Monday of the month, and though it's hard to believe, by this time next week I'll be all done with this intense month and its challenges. Next Saturday, my Odyssey of the Mind team will compete in their Regional competition in Palm Springs. Unless they place in the top 2 or 3 for their category (which would take nothing short of a miracle) we'll be DONE. ALL DONE. You know when your kids drive you bazonkers and you can barely refrain from knocking their sweet heads together in frustration? Yeah. That's been my life for the last two months, two or three times a week, except with only 1 of my own kids, and three other little beasties darlings. Anyway. Being done with this long chapter of the school year (we've been meeting since early September) makes me feel like hitting the "Refresh" button on life in general, and my house and garden in particular. Spring is on the way. 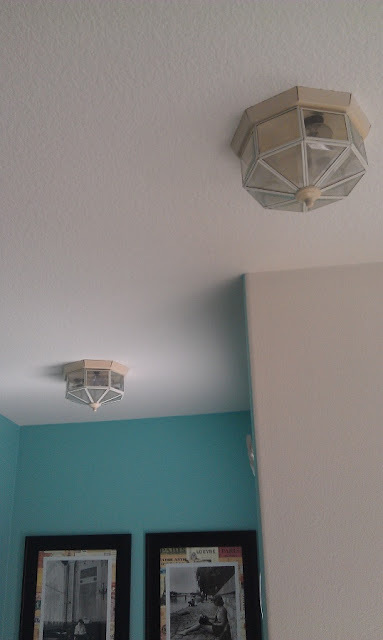 So I have these builder-grade ceiling-mount lights all over my house. We've lived here almost 9 years, and I haven't changed out a single one. But the far one directly over my desk has burned out a couple of bulbs, and the Husband says the wiring is a total mess & fire hazard and needs to be replaced. It's been non-functioning for the whole month. 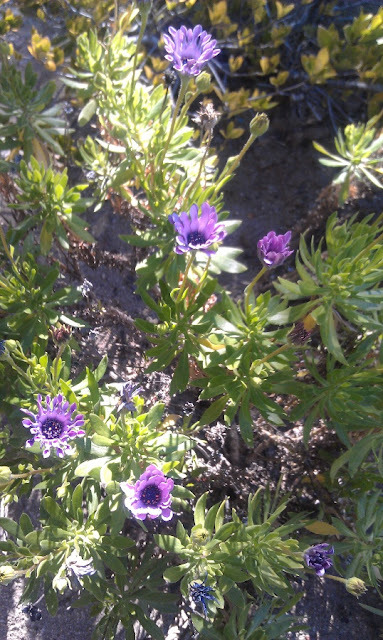 These hardy purple daisy-like bushes are the only thing blooming in my backyard right now. They soldier on, despite the hard-packed dirt that passes for soil in the flowerbed. I really need to give some attention to this section of our yard. For all my good ideas for the interior, I have a really hard time imagining what to do with our outdoor spaces. For instance, take this little rectangle of dirt. I believe the former owners used this as some sort of pitching/practice mound for their son. Again, in the almost 9 years since we've owned our house, I haven't figured out what to do with it. A few years ago, the Husband threw a date seed in the dirt, and lo! 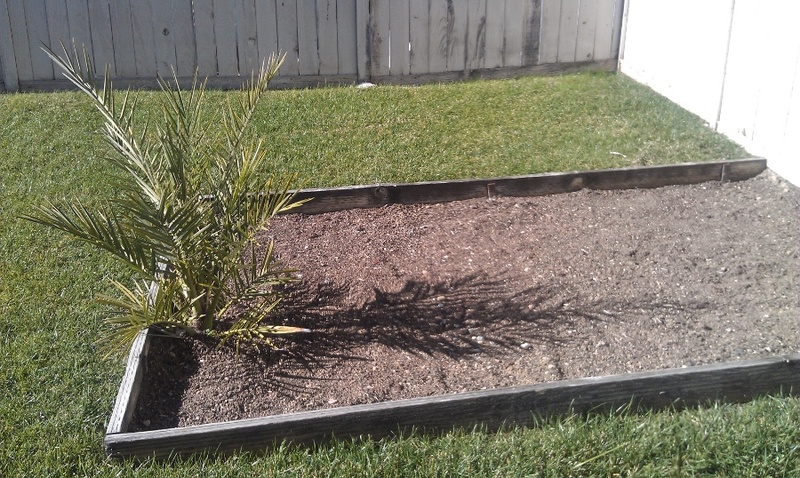 Now we have a date palm. 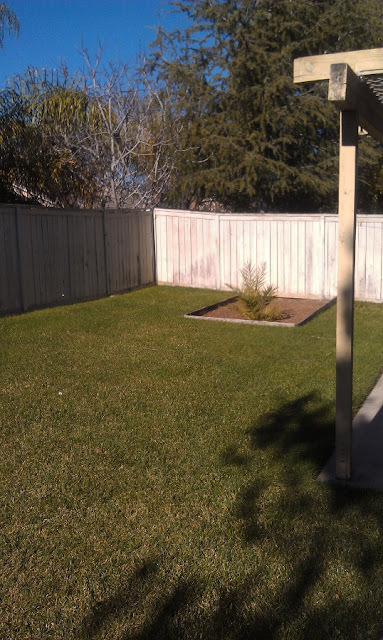 A couple years back, I laid out an outdoor rug and a plastic Adirondack chair (this area gets shady in the late afternoon), but that didn't last. Ideally, I'd like to plant a small vegetable garden out here. Tucker, my burgeoning vegetarian, would love it! But again, I have zero idea on how to begin. 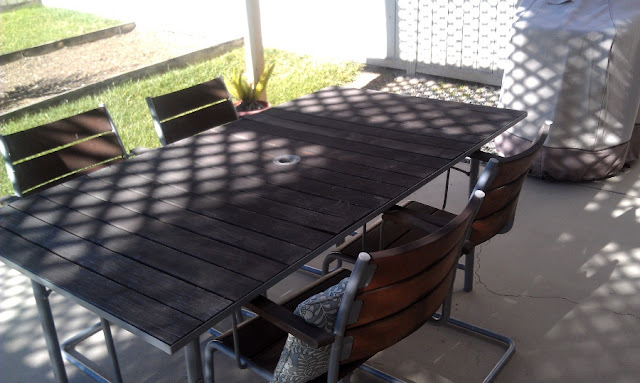 On the other hand, I know precisely what I'd like to do with our outdoor table: clean it up & sell it! And buy a new, comfortable sectional that we would actually sit on and enjoy. For all our great weather, we rarely eat outside. For one, our area gets a lot of flies in the summer, and two...we'll we're just lazy and don't think about it. But a sectional with a couple side tables and a small firepit? Yeah. I think we'd be out here a lot more. So that's just some of the ways I want to hit the "Refresh" button around here and get ready for spring & summer. (And I didn't even get to the front porch.) So many idea...so little moola. I'll just have to get creative. L.A. Music: The Lakers, and I Love L.A. But I was inspired this week by the passing of Dr. Jerry Buss, the owner of the Lakers. Now, I'm not a huge sports fan by any measure. But the Lakers have been a part of my life, a constant on the perimeters of my life, for a very long time. Growing up in L.A. county in the '80s, the Lakers reigned supreme, even in the years when they didn't win a championship. I have vivid memories of when I was a teenager living in our small apartment building, watching the Lakers in the play-offs, hearing the neighbors' televisions all tuned to the same channel through our open sliding patio door. Everyone listening to Chick Hearn calling the plays. Everyone either shouting with happiness or screaming at their TV's in frustration. I know it wasn't really everyone. But it sounded and felt as though it was. On the nights when they did win a championship, I would rush to turn my radio to KLOS, the classic rock station. (Though it wasn't "classic rock" then). The DJ would be excited and crowing about the Laker's winning again, and then he or she would play Queen's "We Are the Champions" and again, it felt like everyone in a city of millions and millions was all singing along.They probably still do that on KLOS, and in every city around the country when the home team wins. But when I was 14, or 16 I wasn't thinking about the whole country, and radio stations weren't all owned by Clear Channel. And I remember where I was working, and the terrible feeling that ran through the office, and by extension the whole city, when Magic Johnson announced that he had HIV and would be immediately retiring. I remember that day like older people remember where they were when Kennedy was killed -- it felt that big, and that impossible. It was a nice, fitting touch that Randy Newman performed at Dr. Buss's memorial this Thursday. He sang "You've Got A Friend In Me," which he wrote for Toy Story. Randy Newman has also been part of the Laker's mythology for a long time, as his I Love L.A. gets played before every home game at the Staples Center arena. So here's I Love L.A. Which looks exactly like the L.A. I know & love and grew up in. Even if it does show clips of Disneyland, which isn't even in the same county, but is still part of L.A.. Freeways and sprawl and low-riders and strip malls and blue sky: Home. We were born to ride. Speaking of tourists: wow, there were a lot of 'em out on Saturday. Arguably, most people out walking and taking photos in La Jolla village are tourists, but I mean...there were a whole lot of international visitors out and about on this day. I guess winter in San Diego is prime time to get away from northern climates, as there seemed to be a fair share of Europeans visiting, just from casually overhearing conversations. Tourists, and kayakers. La Jolla is lousy with them. Acccording to the sign on the lifeguard tower, the water temperature was 56 degrees. There were some brave souls, swimming and snorkeling in wetsuits. They screamed and cursed each time a big wave came up and drenched them. Then they laughed and sat back down and waited for the next one. The water looked very clear and turquoise. It made me want to jump in, too. 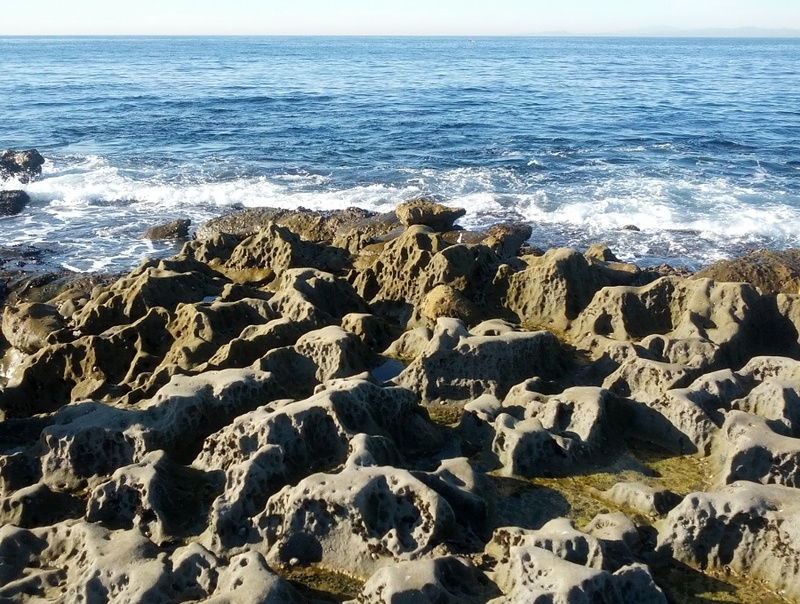 There are also lots of tidepools along the rocks. 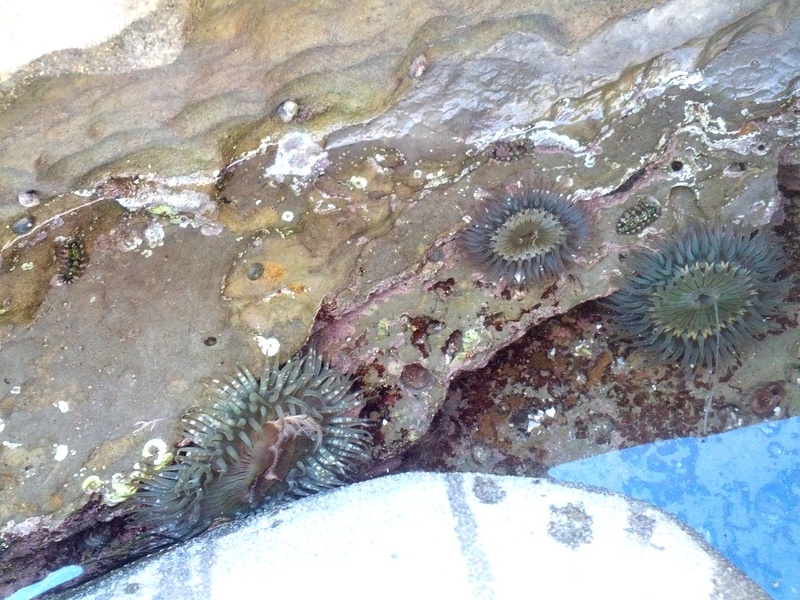 The kids were fascinated with the anemones. It was a good afternoon. 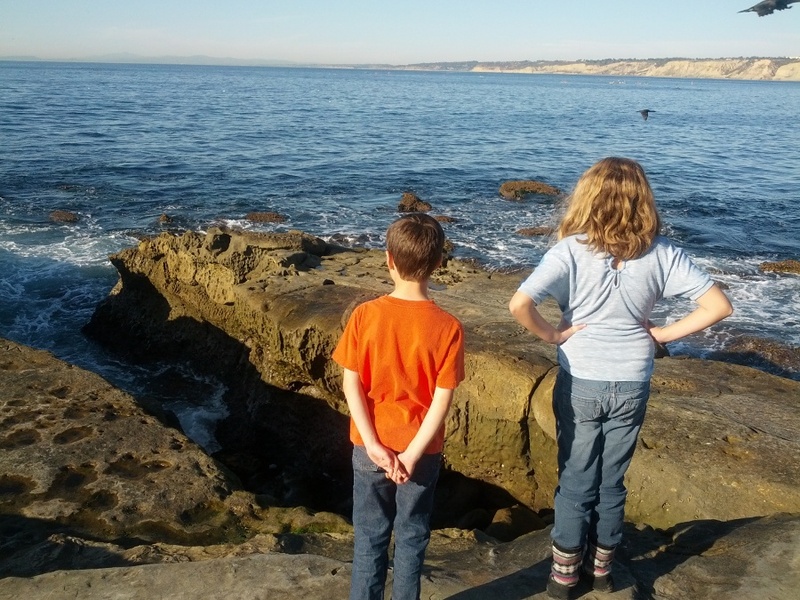 Sunshine, waves, the smell of the ocean: It could only have been better if my kids had actually been able to get wet. (Don't think they didn't try to plead their case.) Poor children -- they've been on rocks and piers and boardwalks aplenty over the last nine months, but it's been ages and ages since they got to truly play at the beach, with bathing suits and towels. Summer will get here. In the meantime, La Jolla, an hour away in the winter? Plenty good enough. It was rainy, cloudy and chilly for most of this weekend, so I was happy to wake up and enjoy a morning walk under clear blue skies this Monday. It was mostly a quiet, lazy weekend, but the week was busy and action-packed with routines. 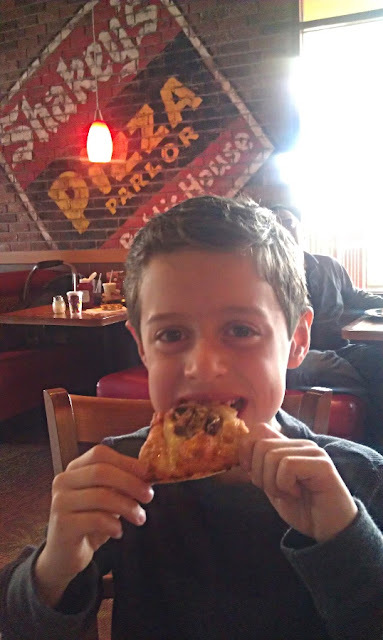 On Sunday I took Tucker to a birthday party, just an informal thing at a pizza parlour. Amazing how some arcade tokens and plastic prizes can make kids so happy. Tucker doesn't have the busy social calendar of his big sister, and doesn't yet have a true best friend. Sometimes this makes him sad, and I feel bad that she gets to do more Fun Stuff -- sleepovers and play dates and Girl Scout field trips and such. 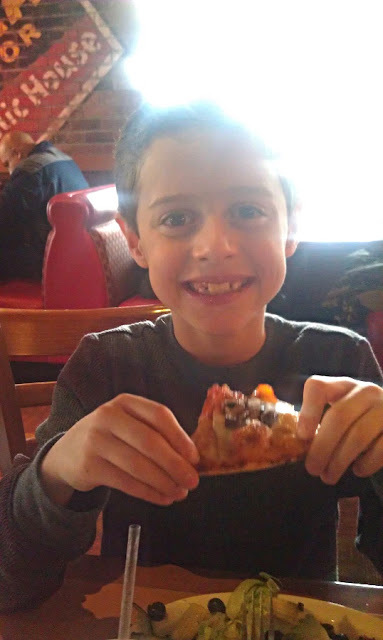 Still, I know that he's only 8 -- his time for pool parties and sleep-overs will come. Meanwhile, I was happy that he had such a fun couple of hours helping his friend celebrate. 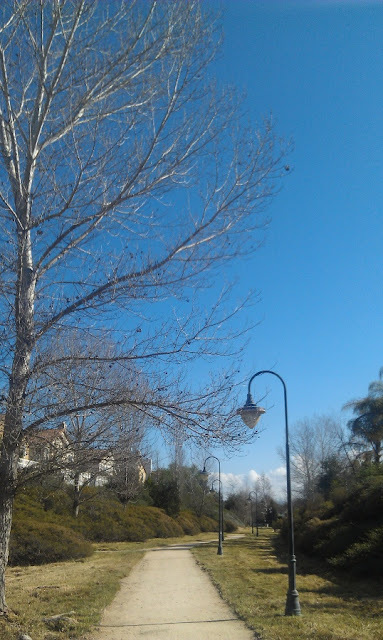 Go ahead: roll your eyes and shake your head at this California wimp, but damn I was happy the sun came out today. I know it was miserable in the East this weekend, but their reality is so hard for me to relate to, never having even visited. For our family of Cali natives, watching news footage of blizzards and snow and ice is like watching a sci-fi movie -- it's that foreign and exotic. Meanwhile, on Friday night, returning from dinner, we drove through a small hailstorm. It poured down on us for several minutes, and the street in our headlights turned white with hail stones. The car thermometer read 37 degrees out, and Lily started willing the temps to drop another 5 degrees -- then it will snow! Sadly, by the time we got home, the temp had risen to 40 degrees and the hail had stopped. But! There was an accumulation of slushy ice at the bottom of the windshield, and the kids scooped it up and made a couple "snowballs." And that is our version of extreme winter weather. 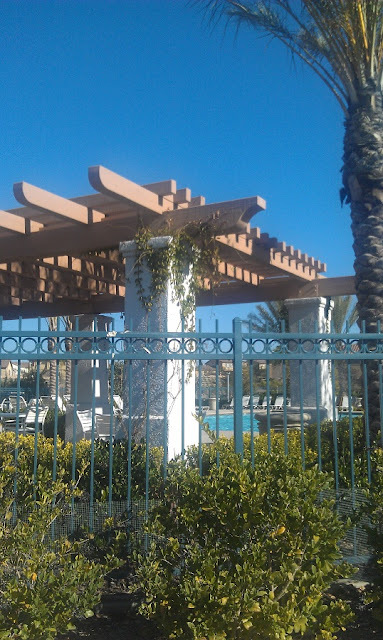 Today I walked by the new pool that the HOA built last year. It must be heated -- it was 43 degrees on my walk and somebody was swimming laps. Or maybe somebody just has visitors in from Canada. I'm looking forward to trying out the new pool sometime in the coming months. But not now: damn, it's cold outside! Recently I rescued some of my favorite books from storage in the garage. (More on that soon.) These included some by one of my favorite writers, Laurie Colwin. Her take on life and love and marriage (and food!) via her upscale, brainy New Yorkers is always so sharp and warm and wise. This weekend I re-read Another Marvelous Thing, about a young woman and older man who meet and fall into a deep love affair, despite being quite happily married to other people. Considering that I first read this book when I was single and in my early 20s, it feels like a much different read now. Speaking of love & marriage, it's Valentine's this week. Uh-oh! Well, the husband and I are somewhat circumventing that treacherous date by having our date night on Friday the 15th. Still, that doesn't mean the 14th can't be romantic. Right? Right? At least, that's what it looked like until a couple of months ago. That orange sofa is a full-size Ikea futon, and it has serviced our infrequent house guests for the last several years. In the last year, its thin mattress developed quite a ridge, I guess from usually being in a folded position as a sofa. Enter in our cheap mattress, from my post "The High Cost of Being Cheap." The saga of that discount, too-soft mattress was supposed to end with me selling it on Craigslist (we only used it for 6 months), or even just getting rid of the thing on Freecycle. But then I started feeling bad for my family members who had to sleep on that thin, lumpy futon mattress when they came to stay. They were polite and always claimed they slept well enough, though my sister mentioned having to "get used" to that ridge that hit around her hip bone. So now the room looks a little more crowded, a little less "done." But I've hosted two guests on this new-to-them queen mattress, and they're quite happy with the results. (Especially my sister, who shares the bed with my restless eight-year-old nephew). Right now, the box spring is just sitting on the floor, but my mom claims that she has an extra set of bed rails that I'll snag on our next visit. After the rails are on, I'll be able to put on some kind of bed skirt or sheet and cover up that unsightly bare mattress. More Ikea, in the form of a wardrobe and my kids' computer desk. When we moved into our house eight years ago, the room initially served as solely a guest room. Then it morphed into more of a playroom/toy storage space. Now, as my kids get older, it's cycling back into more of a guestroom. Below is a view of my front door and tiny foyer. You can see how guests can see the play/guest room right off the bat. I'm not happy that one of the first things they see is a bare box spring and that just-for-now duvet cover on the bed, but oh well. At least my guests get a better night's sleep. 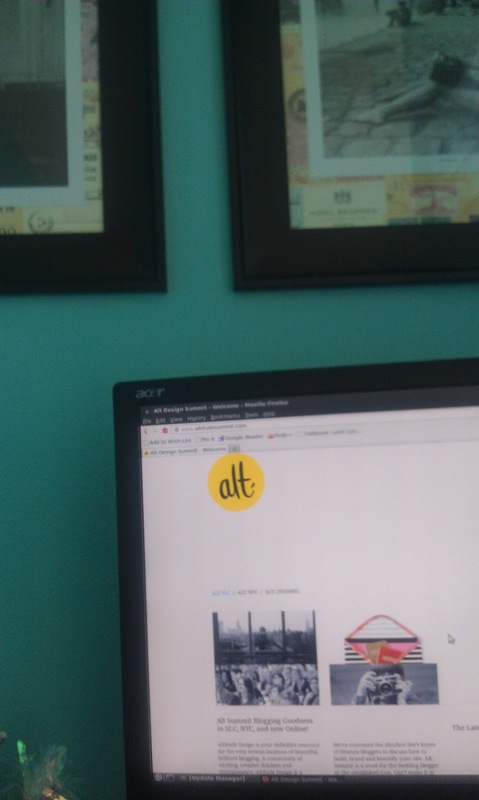 Last week I (and probably you) encountered a lot of recap posts from bloggers who attended the popular Alt Summit conference in Salt Lake City. After reading about the speakers, the parties, and viewing photos of lovely, well-groomed and straight-haired attendees, I admit to wondering (again) about the point of my own blog. I started it a long time ago, just as an outlet to share some thoughts and images about books and decorating projects around my house, plus some occasional asides about my children and life in general. Lately, the blog focuses more on our weekend getaways, a few decor projects, and the occasional book review. And the kids, and life in general. My secret hope at the core of all this oversharing has always been connection & community: finding new contacts and like-minded souls, maybe even a true friend (or two). I personally haven't found that "community" that other bloggers often gush about. Connections & community are the buttercream frosting, the good stuff that makes all those hours with your bum in the chair worthwhile. Or so I've heard. I need to make my peace with the fact that, several years into blogging, the community thing has failed to happen for me. Or to put it more bluntly....blogging just might not be my thang. But writing? Writing, that self-reflective, solitary, isolated occupation? That is my thang. Totally. But, I can't Facebook it, Twitter it, share cool, well-composed photos of it. All I can do is...do it. Or not. But either way. I think it's time to stop thinking of myself as a "blogger." No, I'm not going anywhere. Not shutting down the blog, not at all. The change is all up here, in my head. Thinking of myself as a blogger, trying to grow my readership and find my elusive community, provided me with an excuse to log in hundreds and hundreds of hours sitting at my desk last year. I'm tired of doing that. Tired of living vicariously through other blogs, tired of checking stats that never change, tired of leaving chirpy comments in hopes of...what? Winning a new purse, a gift card, or hoping some other hapless soul might follow my link back here? Bah. In light of all that, despite or because or whatever, I signed up for a writing retreat taking place in Washington state next month. I'm kinda terrified of the whole thing: meeting new people, committing myself (financially, if nothing else) so deeply to the memoir I started writing two years ago. And flying solo, navigating my way through airline terminals and public transit to reach my destination in the mountains outside Seattle. Yikes. But I'm doing my online research and hope to purchase my plane tickets this week. I haven't flown in years, and haven't travelled so far, all by myself, since before I was married. Change is in the air. Or at least I hope so, because this? This commitment to an idea that has yet to give anything concretely positive back to me? This isn't working.